Like most people, l grew up inclined to become a medical doctor. That’s what we were all told to do at some point. If one had the brains or the potential, medicine was the standard path to follow. The first day of college classes, l attended a Chemistry class and we were doing Quantum Chemistry. Chemistry is a prerequisite for those planning to become doctors. I was fortunate enough to also attend an introductory to Computer Science class called Computational Networking. I was bored in Chemistry class. There was nothing entirely new that l learned in the class. However, l was amazed by my Computer Science class. Everything in the class was entirely new. The class gave me the power to create. I made a small program that displayed a responsive button and a text area. As l go into my second year, l would like to share some of the important things l have learned from studying Computer Science and why you should consider studying it. 1. Computer Science teaches you different ways of thinking. Computer science involves the use of logical thinking. Most students drop out of their introductory to computer science classes because the thinking involved might be so foreign to them. The best way is to stick with it until one understands it. Thinking logically is a valuable skill to have – you can use it in some of your university classes and in your career even if it doesn’t involve programming. 2. It is okay to make mistakes and fail. Prior to studying computer science, most situations were make or break for me. Computer Science taught to not be afraid; to experiment; and to learn from failure. Writing a computer program often involves writing computer code with bugs ( mistakes ). One has to go through the process of debugging the code so that a program runs correctly. This can be a frustrating process for novice programmers. When one begins programming their code usually has a lot of bugs. The debugging process often requires patience and care. Computer Science programs can be as simple as creating a single button and a complete web browser. Writing complex programs often requires a partner or two. When writing a program as a team, a lot of co-ordination is required. This involves a lot of communication and planning with your partners. This can be from a single day to an entire month. Programming can be challenging. Even the best programmers don’t know everything. It’s normal to ask for help from your fellow students, teaching assistants and professors. Computer Science taught me that asking for help is not a sign of weakness but rather a passion for understanding. It is okay not to know something as long as you make an effort to find someone who can help you. 4. You get to play master of your own little universe…well…almost. Despite the image of Computer Science the media often portrays, Computer Science is not about making platforms like Facebook or games like Angry Birds. It is simply a way of solving problems. The skills that can be acquired from studying Computer Science, for example thinking logically and algorithmically, can be applied to real-world problems. Problems that often seem daunting can be solved with code. Computer science helps you to break complex problems into simple problems whose solutions can often be applied to the complex problems. You get to think like a computer except you have the freedom to identify problems and come up with their solutions. This ability to solve problems is very empowering. One of the great advantages that come with being proficient in computer science is you get to take part in hackathons. At hackathons you get to make cool stuff. Ideas can be converted into products in under two days. Hackathons are also a great way to meet mentors and learn about new technologies and projects. I fondly remember my very first hackathon because l made an app for a smartwatch and met Alexis Ohanian. Thanks to the diversity in IT, there are other majors that you can pick besides Computer Science. Which ones would you suggest, and why? If you’re technically minded and want everything mentioned in this article (and more), I’d recommend Electronic Engineering. There is a massive overlap between EE & CS, and Electronic Engineers can do most things Comp Scientists can (but not the other way around!). Yes EE is better by far but the ordinary Zimbabwean does not have physical science at O Level and thereby does not have sciences at A Level but can still do Comp Science and fails to qualify for EE. CS is the way to go. To be successful in computers, l highly agree you have to think logical. You have to able to simulate real life situations inside your head and still not loose the focus. Second, you need to have a “can do attitude” This helps to explore and make you want to try new things. Third, be ready to fail, fall down. But more important learn to smile dust yourself and start again. Do not be afraid to fail. Some of you might think l have degree in computers, l dont. Nor do l ever done A levels. l was born and bred in rurals, grew up there until l finished my ‘O’ levels, never used a computer until l moved to far away lands. It was not easy to learn computers given my background but looking back now where l started l can say it is the ‘can do’ attitude which put me where lm today. Im still learning but if there is a problem both in our company or clients we save, the first thing l do is put everything into logical. I then construct and simulate everything in my head with the help of drawing diagrams in relation to how things should work. If you cannot not put physical world into logical one, then computers are not your area. As a senior research engineer specializing in computational science, my personal experience is that Computer Engineering is far better than Computer Science. There is a big difference between the two. I have even run into companies that refuse to hire people with computer science degrees since engineers are preferred. What you want is a degree that says B.S. or M.S. in Computer Engineering. Do not go for a degree in science with a specialty in computer engineering. That is not the same thing as a degree in computer engineering. 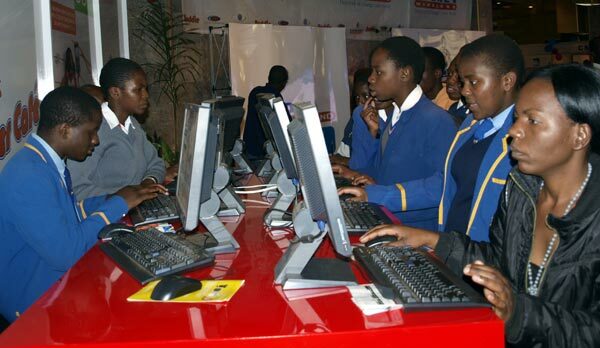 In Zim they should start offering Computer Science in High School, i know some schools do but not a lot. I did Computer Science at A-Level and went on to do Electronics Engineering overseas at University and i must say the first 2 years, most of the modules with Computer Science people were the same until final year when we went different paths. I think its a matter of what you enjoy/like; i didnt do Computer Science because im not a Software person…preferred the non software side of Engineering and most of my friends who did Computer Science have gone on to start their companies…from App development to consulting companies..which is really good for them…im working for someone and enjoying it…like i said at the end of the day its just doing research and seeing what each course offers and if its something that you think you would enjoy doing then go for it…never do it simply for the money…mari ichauya if you are doing what you are good at and like at the same time.